Heat wave spell continues unabated in most places across the country. This trend of high day max temperatures is likely to prolong further. The said conditions are likely to continue over few places in Jharkhand, Chhattisgarh, Telangana, Rayalseema. Moving towards Northeast India, rains continue to batter Cherrapunji, Meghalaya, Assam, and Mizoram. Heavy to very heavy rainfall likely to continue over the aforementioned states. Thunderstorms with squally weather likely at isolated places over Assam. AP likely to see sizzling temperatures. Places like Nellore, Tirupati may see temperatures up to 42°C-43°C. Suburban areas of Chennai will see temperature between 39 and 41 C.
A trough of low pressure area over Equatorial Indian Ocean adjoining Southeast Arabian Sea may initiate some rains over Kerala, and Southern tip of Tamil Nadu. Tamil Nadu in general to remain hot and dry. 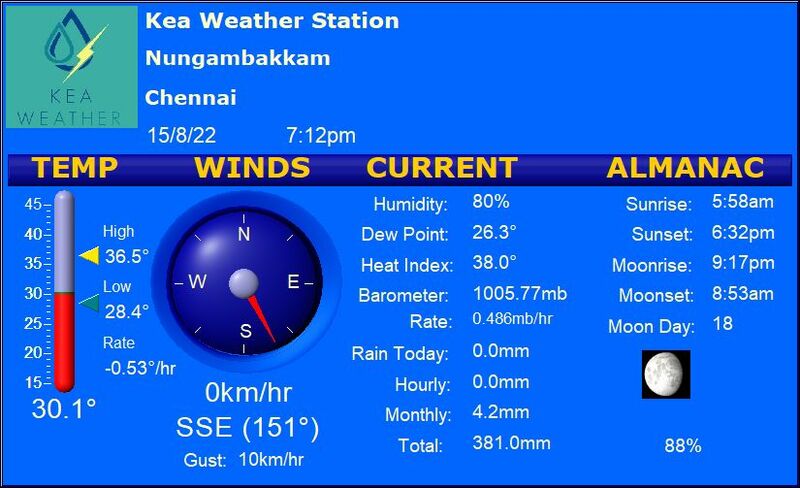 Coimbatore – Scattered clouds around, a day high of 37.5 degrees and the low would settle close to 26 degrees. Vellore – A bright sunny day ahead. With max temperatures around 41°C and min around 28°C. Trichy – To witness clear skies, and a sizzling day. Max temperature settling around 41 degrees. A minimum of 27 degrees will prevail.